Our guide to San Francisco will help you find the best bed and breakfasts in San Francisco California. San Francisco makes it wonderfully easy to tap into the Good Life. Between the hot arts scene, the tempting boutiques, the awesome bay views, and all those stellar, locally focused restaurants and wine bars, it's the perfect place to indulge yourself. There are tons of great bed and breakfasts in the city of San Francisco, our city guide will help you find the best bed and breakfasts. You may have a hard time deciding what to do in San Francisco, but we make your decision easy. 2229 Union St, (415) 346-0424 - The Union Street Inn Bed and Breakfast combines the elegance and gentility of an Edwardian home. 5 Dolores Ter, (415) 899-0060 - San Francisco Country Cottage bed and breakfast is only about 10 min. drive or streetcar to Downtown, Moscone Center, Union Square or Chinatown. There are plenty more bed and breakfasts in San Francisco. 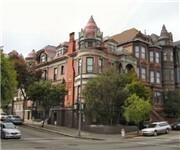 See all bed and breakfasts in San Francisco California.